Questions about classes? Please check our FAQ (Frequently Asked Questions) page. It seems cliché, but it’s a fact; there are countless benefits to Art Classes for Children & Kids. It can be a life-changing experience, which is why Hunakai Studio is proud to offer Art Classes for Children & Kids near Medfield, MA. For starters, art stimulates the brain and helps kids read better and be more proficient in math, science and other fields, not to mention instilling in them a greater awareness of the physical world, including hand-eye coordination and faster perceptual development. By enrolling your child in art classes, you’re putting them on the fast track to a world of open-ended possibility where creativity solves problems and the soul is nurtured. For more information, see below. There is information regarding the session schedule and grade levels for the various classes (Grades K-4). 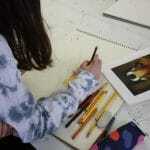 If interested in Art Classes for Children & Kids near Medfield, MA, contact us here to get in touch directly.